I bought this Imperial Debonair as part of a film camera lot on Ebay. I don't recall how much it cost but doubt it was more than a couple of dollars. 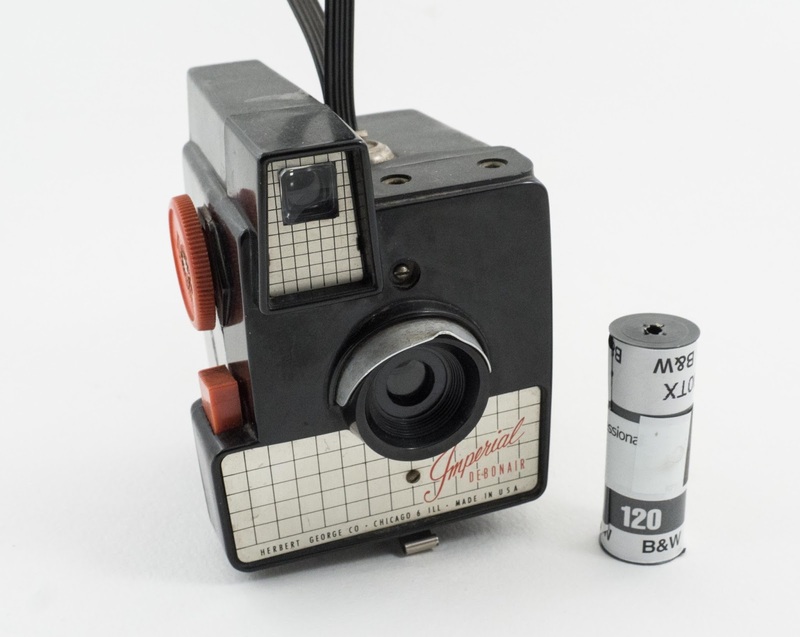 An unusual looking camera somewhat similar to a Kodak Brownie. The difference is there is a look through viewfinder. This is a medium format camera that uses 620 film. I knew nothing about the camera, or the company that sold them, Herbert George Co. It looks cool however. A very 50's, 60's look. When purchased it was in rough shape. Looks like it was either heavily used or just thrown around. I cleaned it up as much as possible, and put it in my "to be used in the future" box. The challenge is unlike my Brownie, I couldn't fit a 120 roll in it. There was a 620 spool already in the camera, but I didn't want to roll my own, and 620 film is either hard to find or expensive. About a month ago, I placed an order with The Film Photography Project store and decided to buy a roll or 620 film. This is rerolled Kodak 400TX 120 film. I loaded the camera up which is straight forward and easy to do. Because of the cracks on the seams I sealed it up with black electrical tape. After about 4 shots the winding knob was becoming very stiff and ultimately wouldn't turn. Hmmm, I took it in a dark room and opened the camera up. The spool had popped off the winder. I snapped the spool back on and closed it up. I took 2 more shots and the same thing happened again. I repeated the open / close routine. One more shot and the camera was toast. I couldn't get it back on the winder, so I took the film out and rolled it up. I think there were at least 2 more photos remaining. So end result I took at least 5-6 shots that I think will come out. The film tore slightly at that point (I noticed this when I rewound the film), so I doubt The Darkroom can process the film. I'll send it in for processing soon and will report back. Process it yourself. Super Easy!